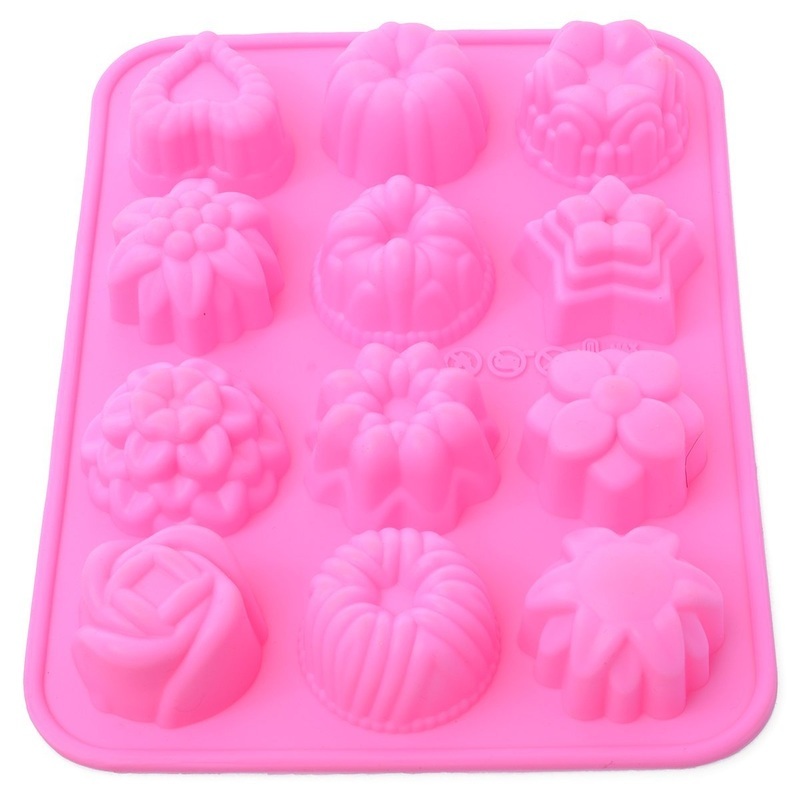 A silicone mould with 12 intricately detailed flower shapes, of a size best suited for small muffins, finger food, gelatine desserts and similar little mouthfuls. It works particularly well for sticky recipes such as cheese muffins that are normally very difficult to extricate without breaking. I received a review sample for evaluation, and at first it seemed strange to put something like this (i.e. not metal or glass) in the oven. I already had experience of baking with silicone mats, but somehow the mould seemed more risky, more prone to melting. Anyway I shouldn't have worried, it worked beautifully. These moulds can handle extremes of temperatures, from -40°C to 230°C, that's -39.99°F to 446°F - quite a wide range! I really like that it allows me to bake without the use of butter to line the mould and without struggling to turn out the little cakes. Also very good for ice cubes, but best suited for long drinks, iced tea and summer punch because the ice cubes it makes are double-sized. The only thing that needs attention is that the silicone is very soft and you need to put a tray underneath when the mould is full of water or whatever mixture you fill it with, on its way to the freezer or the oven. However, the results are certainly worth that small extra step. It's also extremely easy to clean and you can boil it to disinfect it. Brilliant idea. Preferable in every respect to parchment paper and aluminium foil as these silicone baking sheets are reusable and really easy to wash. I used to make biscotti Italian style regularly, but haven't made them (or any kind of biscuit) for a long time because I could not face the mess and upheaval of dealing with sticky dough in industrial quantities. 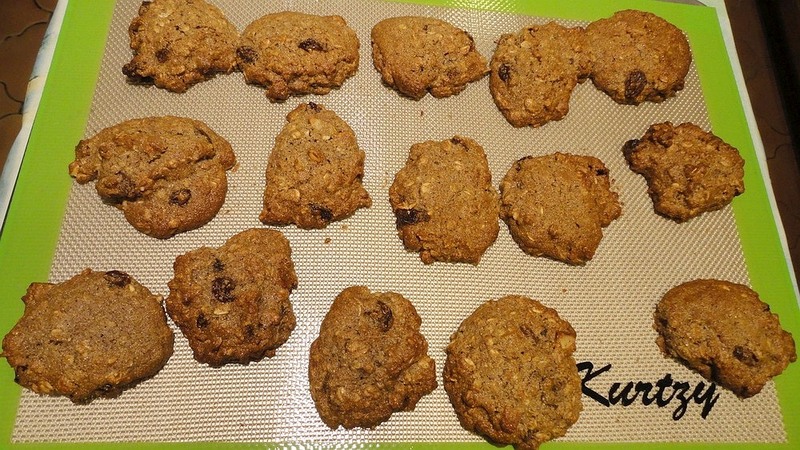 When I was asked to try out these baking sheets, I made a quick oatmeal biscuit recipe to see how they would work out, but was not expecting the inevitable consequences: the biscuits came out so well that now I have to keep making them! Since that first delightful experience, I have used these for many other things, from pizza to meringues to bread. Having two sheets in one package is quite a time saver because I can set out the second batch while the first is baking, and then simply slide the whole sheet over an oven tray. I also find them incredibly useful as a working surface for kneading bread and my infamous biscotti dough. The only restriction is that you cannot cut anything over the silicone as it will be ruined by a blade. That, of course, goes also for any non-stick surface and baking paper so I keep a special cutting board just for that purpose. The other benefit is that these mats distribute the heat so well that foods cook perfectly without burning, and yet pizza crust comes out really crisp. I wish I had known about these sooner. What a great idea! A pair of heat-resistant gloves with fingers! 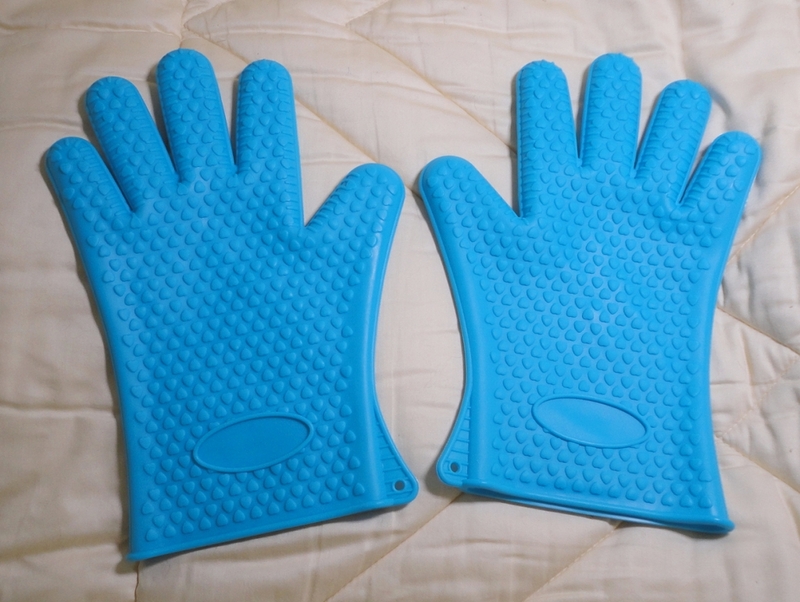 It's only after using these very clever silicone gloves that I realized how awkward it was to use those padded oven mitts for so long. Size-wise these gloves are a good compromise: they fit my medium-sized hands just as well as my husband's larger ones. I thought they might be a bit sticky to put on in a hurry but they are not. The fingers could be a little longer but it's already night and day between these and the mitts. I also love the bright, happy colours. As well as giving me a very secure grip of tins and trays in and out of the oven, I find them really useful for handling bread rolls, hot cookies and muffins, or anything that needs to be turned out of a mould. I was happy to have them when I last made polenta. The hot mixture often burns my hands and wrists while doing all that stirring, but not this time! They are equally brilliant when taking stuff out of the freezer. In fact, I recently defrosted my freezer in half the time it usually takes me because of these gloves. They are also easy to wash and dry quickly. A really useful item kindly provided to me for testing and review purposes. In a small, everyday way, these gloves are life changing.